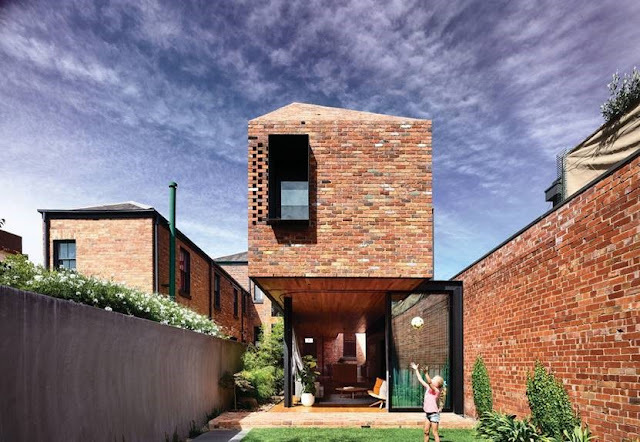 With the majority of social activity within a city occurring at the ground level, it is no surprise that urban design and statutory planning focus on the visual interests, protection of amenity and aesthetic presentation of built form and landscaping from the ground level. However, the form, siting and layout of cities, towns and/or precincts can become eye catching spectacles when viewed from a birds eye perspective, although these views are often rarely seen unless you are flying over a city. Technological advancements in the industry has seen drones become increasingly popular and accessible, as the ability to view and explore cities takes a new form and provides us with the opportunity to views cities from a new perspective. 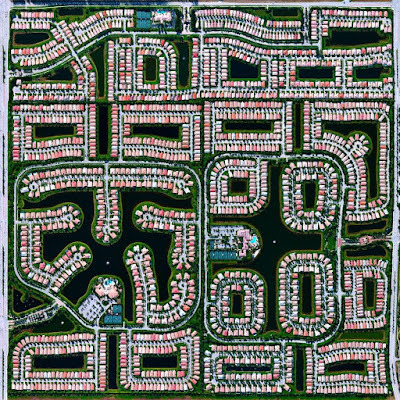 This article seeks to explore cities from a birds eye to view to appreciate and reflect trends in urban planning and development of societies. Viewing cities from an aerial perspective provides the opportunity to identify trends, learn from mistakes, appreciate the aesthetic form, improve functionality of cities. It is also interesting to see how some of the more aesthetic cities perform on a practical level. Initially built as a fortress during the late 16th century, the star shaped town provides a geometric urban form. Palmanova strived to implement the ideal city based on utopian ideas of the time which stemmed from the concept that beauty strengthens the shape of society. 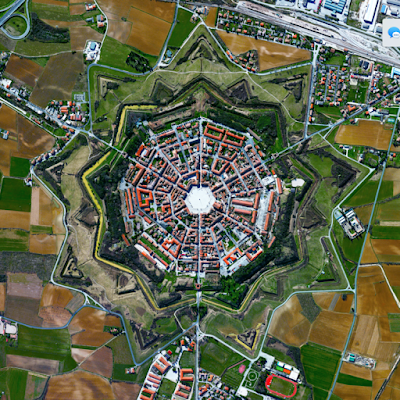 The town of Palmanova although being quite eye catching to look at, did not perform so good on a practical level, with the fortress like walls located on the perimeter of the star being a barrier to its success and integration with surrounding cities/towns. 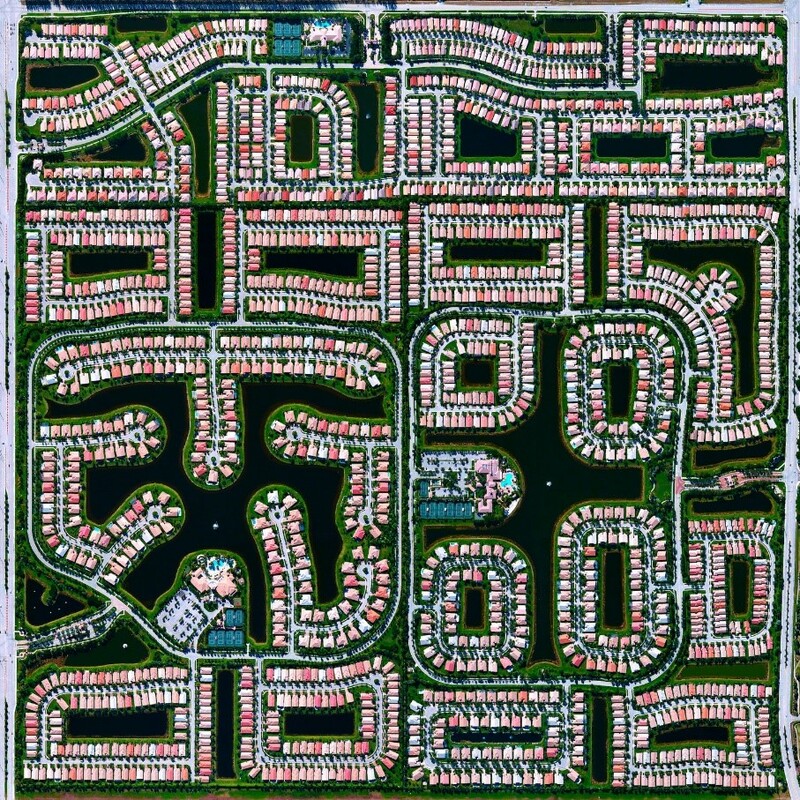 The art of urban sprawl (if there even is such a thing) is demonstrated within Delray Beach, Florida. The layout and form of roads, lakes and cul-de-sacs presents a level of interest at first glance, however this residential development would fail the practically and connectivity test, reflecting a high level of car dependence and limited walkability. 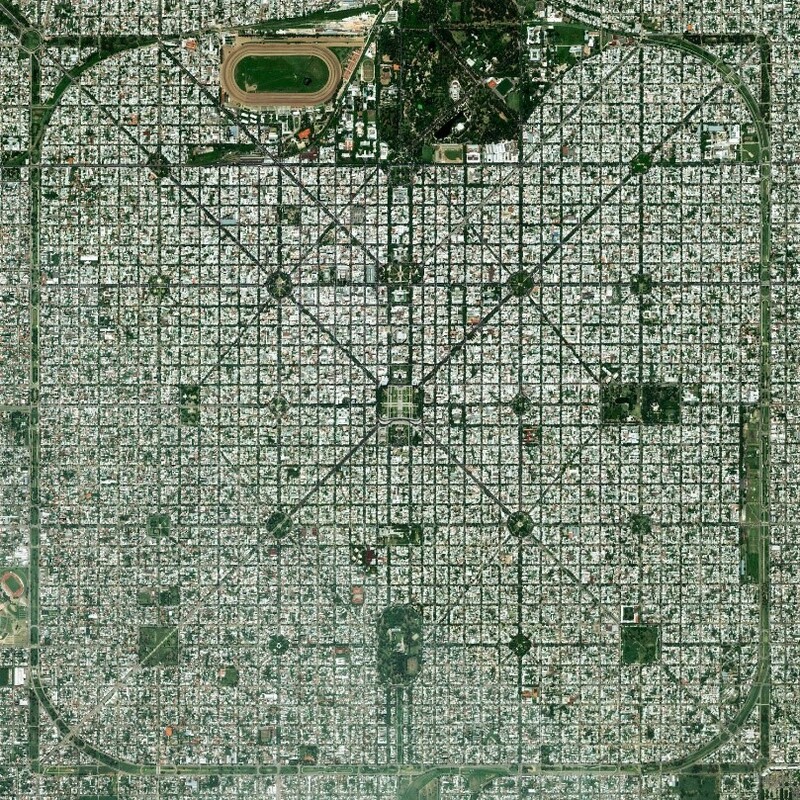 Founded In 1882, the City of La Plata was built with the intention of being the provincial capital of Buenos Aires, possessing a strong grid pattern with diagonal roads connecting parks, public spaces and districts of the city. The city adopts a linear and fairly symmetrical layout which can contribute to a visually aesthetic form while providing practical and predictable trends and movements. The City and urban form is said to have traits of freemason symbolism. Around the time it was built, the city won awards for “the City of the Future” through the rationalist concept of urban form. 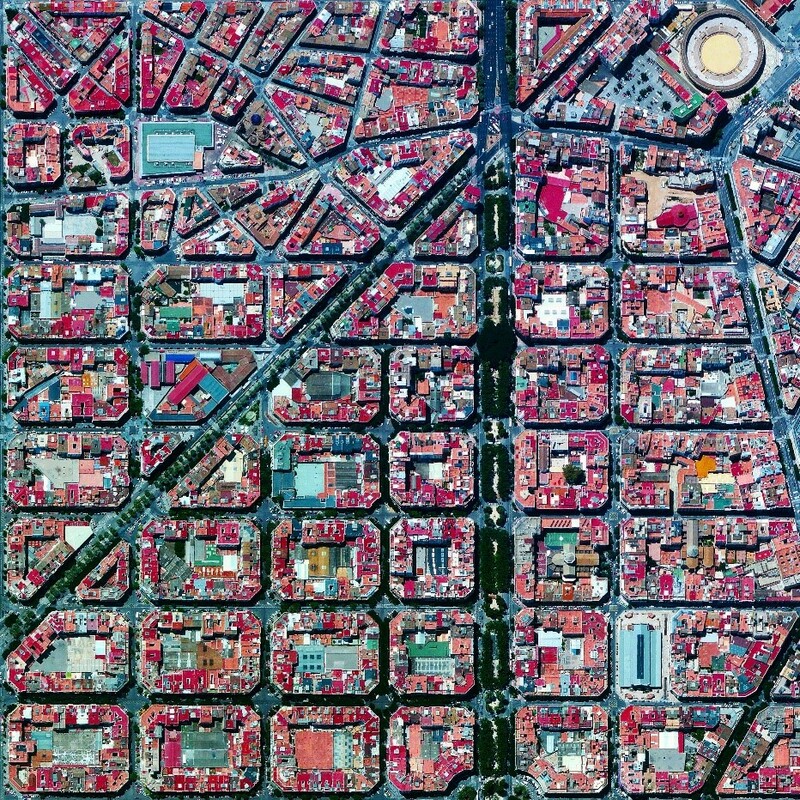 Constructed in the early 19th to 20th Century the term L’Eixample is Catalan and translates to “Expansion”. At the time of construction the city focused its layout and design on transport, light and ventilation, however has now become well known for its long straight streets, wide boulevards and chamfered corners. The communal courtyards located within the grid form have become an iconic urban fabric seen throughout Spain. 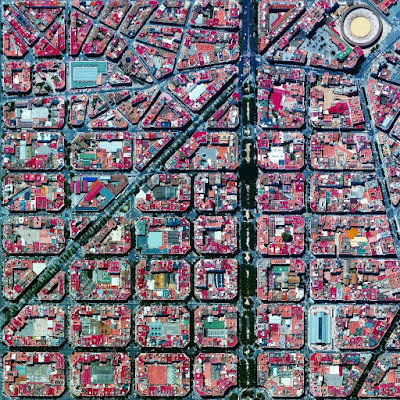 It is evident from some of the photos I’ve shown above that a cities layout and form can contribute to a visually aesthetic urban fabric (from an aerial perspective), as different periods of time, objectives and ideologies shape how these cities functionally perform and are enjoyed by society. Although cities are often developed through a master plan which anticipates future growth from an aerial view, what translates from paper into the urban fabric can change and trends develop over time , providing an opportunity to evaluate the functionality, successes and failures of cities. Do you think a thorough investigation into cities from a birds eye perspective can reveal unexplored concepts in the evaluation and assessment of a cities performance? Are we currently providing a harmonious balance between the visual interest of a city and practicality? 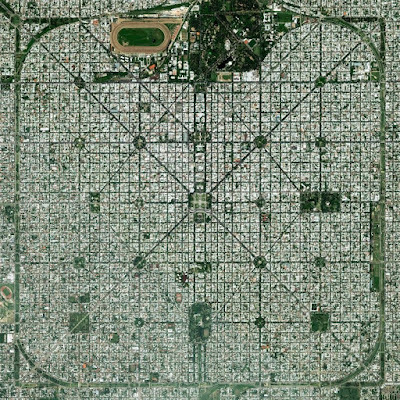 Although a symmetrical city can provide visual interest from an aerial perspective, does this also provide for functional and connected urban centres? What are some of your favourite cities from an aerial perspective?